Update 01.22.2018: The owners of Dreamcatcher Lodge have retired and closed the bed and breakfast. Dreamcatcher Lodge: our kind of Montana getaway. Photo courtesy Dreamcatcher Lodge. When Alan and I look for a Montana getaway, luxury, relaxation and convenience are important requirements. Bonus points if it’s also romantic. We appreciate luxury lodging that offers relaxation but is convenient to the things we want to see and do. 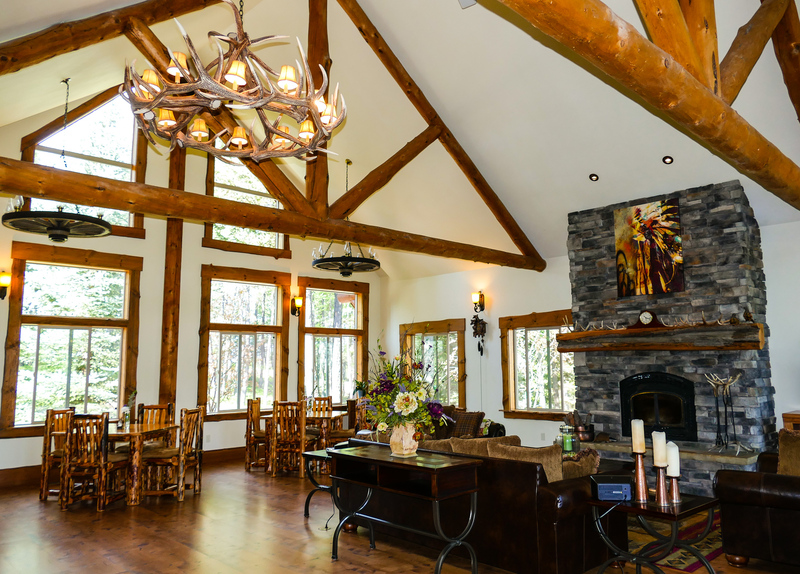 Dreamcatcher Lodge in the Many Lakes area of Kalispell definitely fits our parameters. 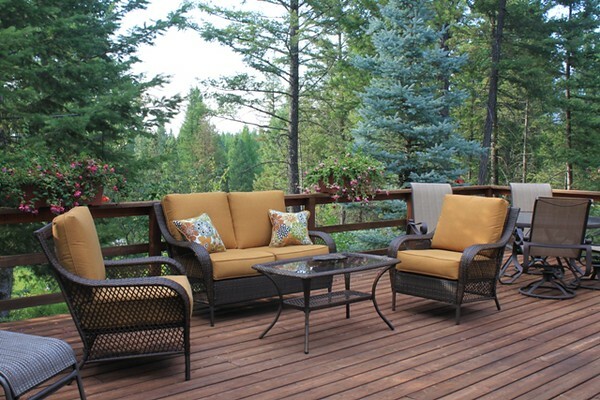 Wouldn’t you like to relax on this deck? Photo courtesy Dreamcatcher Lodge. We stayed at Dreamcatcher Lodge on a spring Montana getaway that included a pre-season visit to Glacier National Park. But, after arriving at the bed and breakfast’s forested setting, I sort of wished we had planned a retreat for doing nothing except reading a book while sitting on the deck or wildlife watching—or a writing retreat, I’m definitely in need of uninterrupted writing time. The luxury log lodge offers four wildlife-themed rooms, each with queen-size beds and a private bath. But the public spaces in the lodge are so enticing that you won’t want to lock yourself away in your bedroom—well, maybe for a nap. The great room offers plenty of seating and views. Alan and I enjoyed sitting in front of the rock fireplace in the great room, with its soaring ceiling. We could have watched the flat screen TV on the wall by the fireplace but who wants to do that when a multitude of windows offer prime bird and nature watching? Almond croissant French toast tastes just as good as it looks. The dining area of the great room is where owner Michele Martino serves up culinary magic each morning. 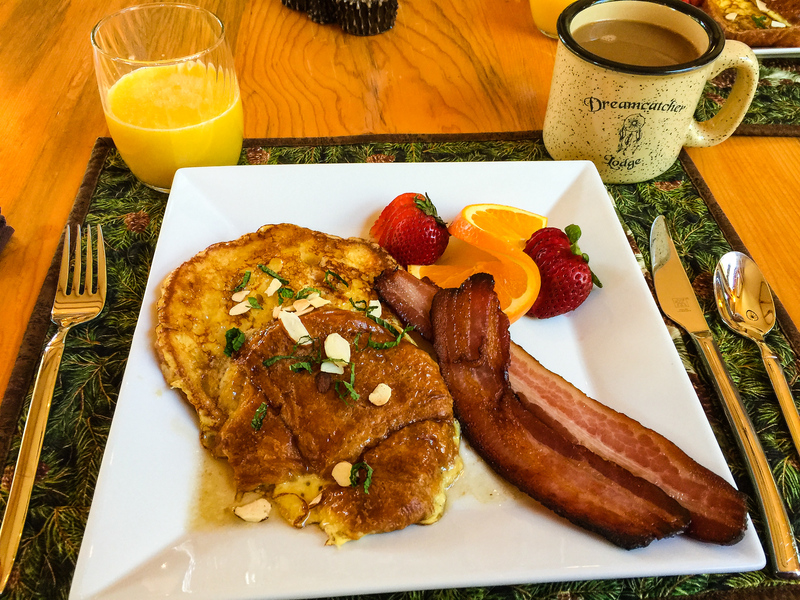 Have you ever had almond croissant French toast? Oh my! On another morning, Michele served Tasso ham and cheddar quiche accompanied by chocolate cheese Danish. And she cures the meats and bacon herself. A cozy downstairs den offers another TV viewing area as well as a video library, books and games. There’s also a guest refrigerator, stocked with water and soft drinks, plus a Keurig coffeemaker with all the fixings for coffee, tea or hot chocolate. And a hot beverage goes well with the huckleberry cookies that we found on the nightstand next to the bed. With Glacier National Park about 40 minutes away, Dreamcatcher Lodge makes a convenient (and luxurious) headquarters for visiting one of the national park system’s gems. Dreamcatcher is an especially good choice for fall, winter and spring visits when park lodging is closed and other choices are limited. For that matter, you’ll avoid crowded, noisy accommodations during a summer visit if you’re staying a the lodge. Walking Going to the Sun Road without any traffic. Yes! Alan and I purposely planned our Montana getaway at Dreamcatcher Lodge to visit Glacier National Park before the summer crowds arrived. At the time of our trip, Going to the Sun Road was open to the parking lot of Lake McDonald Lodge. From there, we joined hikers and bicyclists enjoying the plowed portion of the road that was still closed to vehicular traffic. At times, we had the road, and the park, completely to ourselves. What a luxury! No matter what time of year you visit Glacier National Park. Bring bear spray! 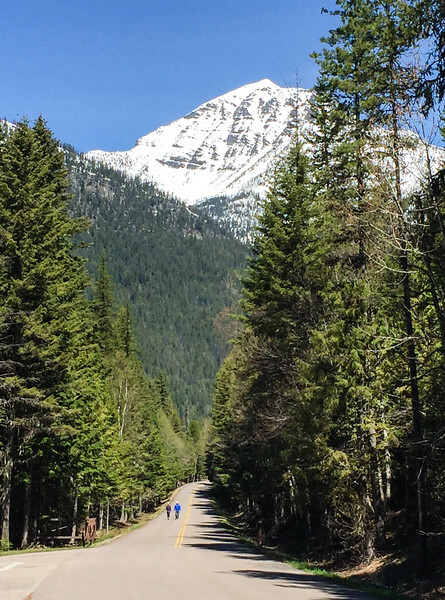 This summer, we’ll be looking for an empty night or two on Dreamcatcher’s schedule so that we can drive up to Polebridge, our favorite off-the-beaten-path destination near Glacier National Park. After exploring Kintla or Bowman Lake in the park, we’ll stop for dinner at the Northern Lights Café in Polebridge, a funky favorite from our very first trip to Glacier. And there still will be enough light for a safe drive back to Dreamcatcher Lodge. Of course you don’t have to drive all the way to Polebridge for dinner. The lodge is conveniently located between Big Fork and Kalispell, both offering excellent restaurants. On our visit, Alan and I enjoyed dinner at Hop’s Downtown Grill in Kalispell one night. Another option is to stop by the market to bring snacks and wine back to the lodge for a light supper in the den. That’s what we did after our day of walking on Going to the Sun Road. Active boomer travelers will find so much to do in this area of Montana. On our list: hiking the Jewell Basin trails in the Swan Mountains, white water rafting in Glacier National Park and exploring the National Bison Range. Returning to Dreamcatcher Lodge will be the reward after a long day of outdoor recreation. Or maybe Alan and I will plan a fall Montana getaway at Dreamcatcher Lodge for that writing/photographer’s retreat that I keep dreaming about. A girl can hope. Planning a trip to Glacier National Park? Don’t leave home without reading about our Glacier National Park adventures. Have you stayed at Dreamcatcher Lodge? 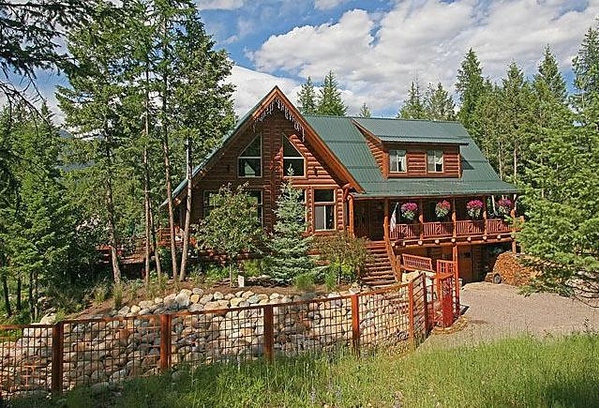 Or do you have a favorite luxurious Montana getaway that Alan and I should add to our to-do list? Come join the conversation at the My Itchy Travel Feet page on Facebook. Or send us an email with your thoughts. Disclosure: Affiliate links have been included for your convenience. However My Itchy Travel Feet receives a small percentage of the sale at no additional cost to you.